There is great variety in dance in the United States of America. It is the home of the hip hop dance and its derivative Rock and Roll, and modern square dance (associated with the United States of America due to its historic development in that country—nineteen U.S. states have designated it as their official state dance) and one of the major centers for modern dance . There is a variety of social dance and concert or performance dance forms with also a range of traditions of Native American dances. The reality shows and competitions So You Think You Can Dance, Americas Best Dance Crew, and Dancing with the Stars have broadened the audience for dance. Placing great value on improvisation, African American vernacular dances are characterised by ongoing change and development. Because they exist in social spaces and their main 'purpose' is self-expression, they are continually changing to reflect the needs, interests and personalities of their participants. The term "swing dance" refers to a group of dances that developed concurrently with jazz music in the 1920s, 30s and 40s. 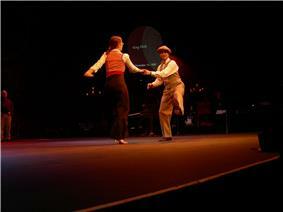 The prototypical swing dance is lindy hop, a popular partner dance that originated in Harlem and is still danced today. While the majority of swing dances began in African American communities as vernacular African American dances, some forms, like Balboa, developed within Anglo-American or other ethnic group communities. Dances such as the Black Bottom, charleston and tap dance travelled north with Dixieland jazz to New York, Kansas City, and Chicago in the Great Migration (African American) of the 1920s, where rural blacks travelled to escape persecution, Jim Crow laws, lynching and unemployment in the South (during the Great Depression). Swinging jazz music features the syncopated timing associated with African American and West African music and dance — a combination of crotchets and quavers which many swing dancers interpret as 'triple steps' and 'steps' — yet also introduces changes in the way these rhythms were played — a distinct delay or 'relaxed' approach to timing. American modern dance developed in the early 20th century alongside American music. . 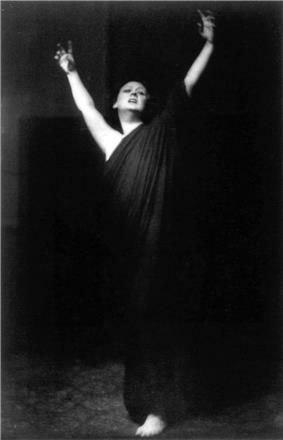 Among the pioneers of modern dance were Isadora Duncan, the dance company of Ruth St. Denis and her husband-partner, Ted Shawn, and their pupils Doris Humphrey and Martha Graham. The early modern dance makers broke with European classical forms by giving into the weight of gravity, initiating movement from the center rather than the limbs, and emphasizing an emotional directness in their choreography. Many of Graham's most popular works were produced in collaboration with leading American composers -- "Appalachian Spring" with Aaron Copland, for example. Dance has an influence on several aspects of society based on televised events, marketing tactics, and televised dance programs. Big events like Grammy awards, the Golden Globes, and the MTV video music awards have featured presentations of dancing that entertains the audience. A lot of what pop culture is based on are the awards and dancing that is featured in these televised events. Some popular competition televised events that are made for dance are Dancing with the Stars, So You Think You Can Dance and America's Best Dance Crew. These dancing shows are unique in that they allow society to interact with them, choosing who they think suits best in the competition. People are able to express more in the modern world compared to before. There are different ways to dance. Dancing is about expressing yourself whether it's related culture or even nothing at all. The behavior that is accepted by the society plays a big role in our way of dance. That's why there are certain dance that are shown on to the public (formal dances) while others are not (referring to sexuality). Over time, dance movements and style has changed. Dancing has evolved through time, and it is changing as relation with music. Music shapes the way a person dances. As beats are changing so are dance movements. For instance, popular songs like Michael Jackson's "Thriller", The Harlem Shake, and "Teach me how to dougie" have influenced dance moves that become trends in society. Hip-hop is taking over the formal dance movements (the ballroom and casual dance performed in parties). As years pass by, dance will continuously change and be more competitive.